« Physical Chemistry of Functionalised Biomedical Nanoparticles – last chance to register! We are pleased to announce that the new Impact Factor* of Faraday Discussions is 4.19. Thanks to all our authors, speakers, readers, delegates, committee members and everyone else who has contributed to the continued success of Faraday Discussions. Not able to join us this year? 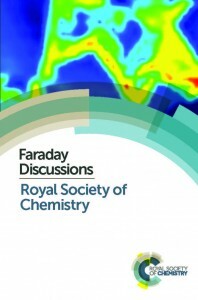 Find out more about the Faraday Discussions we have planned for 2015 and beyond..
Not familiar with the unique format of Faraday Discussions? Check out our FAQs.